Elon Musk on Thursday night: "Our goal here is to fundamentally change the way the world uses energy." LOS ANGELES (Bloomberg) -- Tesla Motors Inc. CEO Elon Musk unveiled a suite of batteries to store electricity for homes, businesses and utilities, saying a greener power grid furthers the company’s mission to provide pollution-free energy. 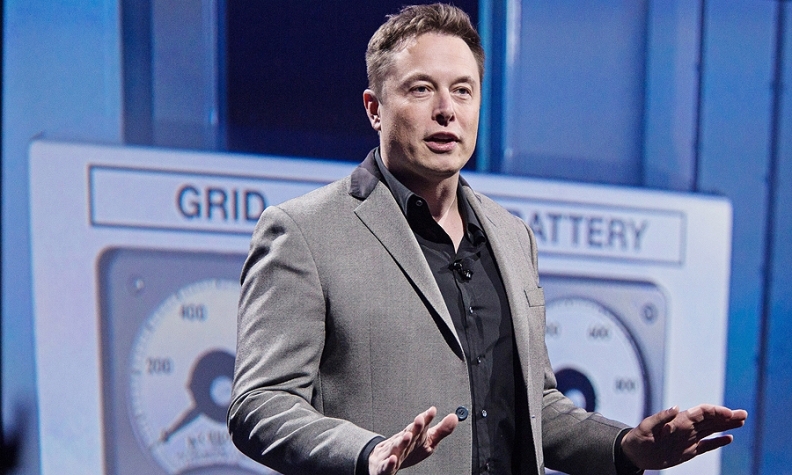 The announcement, after weeks of anticipation, marks Tesla’s expansion beyond electric cars. As homes, businesses and utilities use more renewable energy generated by sunshine and wind, the need to provide reliable power grows. Batteries can be used to store electricity during peak production and dispense it later, when the sun isn’t shining or the wind isn’t blowing. Tesla’s home battery, named “Powerwall,” is a rechargeable lithium-ion battery that mounts on the wall and comes in 7 kilowatt-hour or 10 kilowatt-hour versions, the company said in a statement. Deliveries will begin in late summer at prices starting from $3,000, Tesla said. The battery is designed to enable so-called “load-shifting” by charging during times when electricity prices are lower due to less demand, and discharging when demand and prices are high. It can also store solar power generated during daytime and release it at night, and serve as backup during outages, according to Tesla. The average American home consumes about 30 kilowatt-hours of energy a day, according to the U.S. Energy Information Administration. In the utility industry, storage is finally coming of age. In Tesla’s home state of California, a groundbreaking energy-storage mandate requires PG&E Corp., Edison International’s Southern California Edison and Sempra Energy’s San Diego Gas & Electric to collectively buy 1.3 gigawatts of energy storage capacity by the end of 2020. New York is also turning to storage to relieve congestion on transmission lines and plans for the potential retirement of aging power plants. The power industry has struggled to come up with a cost-effective storage solution, an issue that has become more pressing as growing amounts of solar and wind are integrated into the grid. Tesla’s utility-scale battery will consist of 100 kilowatt-hour blocks that can be grouped to a scale of 500 kilowatt-hours to more than 10 megawatt-hours. Tesla is making a bet that its $5 billion “gigafactory” under construction near Reno, Nev., will enable the mass production needed to drive down battery costs for both cars and energy-storage products that are already serving as a revenue stream for the company. More such factories will be needed to help make the transition from fossil fuels to renewable energy, Musk said. Tesla, whose batteries are already supplying large customers like Wal-Mart Stores Inc., Cargill Inc., and Jackson Family Wines, has formed partnerships with companies including Green Mountain Power to sell its home batteries, it said. The company is also teaming up with Southern California Edison to install batteries for utilities, while Amazon.com Inc. and Target Corp. will pilot use of Tesla’s batteries for businesses.